I spent 38 minutes in cell-splitting terror, thinking I was about to be hit by a nuclear missile. After I got a confirmation from local authorities that we should take shelter, it became gut-punch real. I did not know whether this was one or two missiles from North Korea launched at the height of the “fire and fury” or the start of a full-scale nuclear war with Russia due to accident, miscalculation, blunder. I felt the existential terror of The Doomsday Clock striking midnight, the beginning of the end of the world as we know it, of everyone and everything we know and love. It was an awakening to what is at stake that lives inside my body, in my cellular memory to this day. I have chronicled our family’s moment-to-moment experience of those 38 minutes in Dawn of a new Armageddon in the Bulletin of the Atomic Scientists. 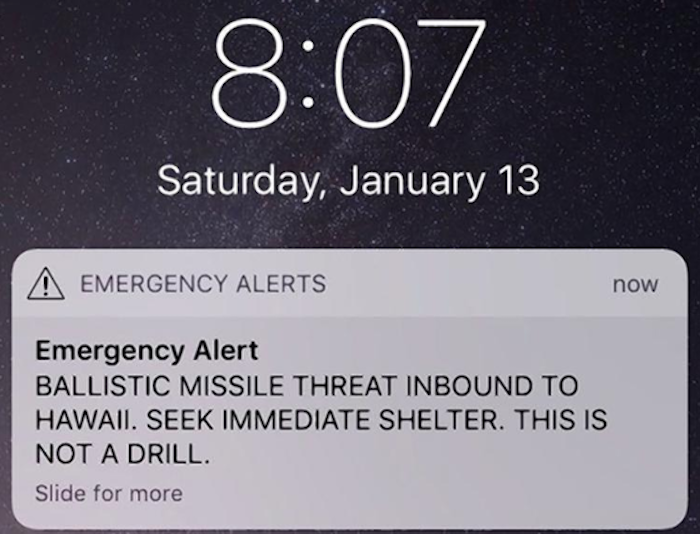 To make the nuclear threat real, I take groups through simulations of getting an emergency alert on their cell phones warning of a nuclear attack just like we got in Hawaii. Wherever they are – Moscow, New York, Washington, Seoul, Islamabad. Former nuclear war planner turned activist Daniel Ellsberg says in his book The Doomsday Machine: Confessions of a Nuclear War Planner that the human race is “not a species that can be trusted with nuclear weapons.” History is proving this out. As I write this, the U.S. and Russia have just announced their withdrawal from the INF Treaty, a centerpiece for arms control and strategic stability that eliminated an entire class of nuclear weapons, reduced the risk of a nuclear exchange in Europe, brought an end to the old Cold War and opened the pathway for other groundbreaking arms control agreements like START I, resulting in the largest reductions in U.S. and Soviet/Russian nuclear arsenals in history. INF has collapsed not only due to U.S. ire over Russia’s prohibited 9M729 cruise missile and Russian claims that the U.S. is violating the treaty because its Aegis Missile Defense System on Russia’s borders is capable of launching Tomahawk cruise missiles. INF has also collapsed because the United States has not had a real nuclear dialogue with Russia for years now, not since the U.S. cut off most talks with Moscow after the events in Ukraine in 2014. Without ongoing talks with Russia, the U.S. will not be able to fix INF, extend New START, or make progress on reducing a host of other nuclear dangers. Former California Governor Jerry Brown says that U.S. politicians must hold open “a channel of nuclear dialogue” with Russia. The United States must not hold these conversations hostage to political differences, but instead must talk and work with Russia and all nuclear powers to reduce the nuclear risk and move towards the eventual elimination of nuclear weapons. I felt the existential terror of The Doomsday Clock striking midnight, the beginning of the end of the world as we know it, of everyone and everything we know and love. One year after we thought the Doomsday Clock struck midnight in Hawaii, I am heartened by the growing grassroots movement emerging across the U.S. focused on transforming nuclear policy. There are people and politicians waking up to the nuclear danger and aligning around steps to be taken and legislation to be adopted in a way that we have not seen since the Nuclear Freeze movement of the 1980s. Congressman Adam Smith, new chair of the House Armed Services Committee, has taken a strong stand against the Trump Administration’s Nuclear Posture Review, which supports a new low-yield nuclear warhead and leaves the door open for nuclear use against non-nuclear attacks. Smith and many of his colleagues in the House and Senate have introduced bold legislation for No First Use of nuclear weapons, restricting presidential launch authority, defunding low-yield nuclear weapons development and prohibiting funding for short and intermediate-range nuclear missiles that violate INF until the Trump Administration meets certain conditions. See The Nuclear Playbook to learn more. I came of age in the 1980s when I was part of a mass global movement of men and women, youth and children that transcended religious, racial, ethnic, gender, cultural, socio-economic and partisan divides. We were all united around one overarching common goal – preventing a nuclear war and creating a secure future for ourselves, our children. Dr. Bernard Lown, who accepted the Nobel Peace Prize in 1985 on behalf of the International Physicians to Prevent Nuclear War, said, “Politicians need to be compelled by people whose lives are in jeopardy.” We the people united and compelled our leaders to transform nuclear policy in the 1980s. We can and must do so again today. Cynthia Lazaroff is the founder of NuclearWakeUpCall.Earth. She is a documentary filmmaker who over the past two years has been interviewing officials and experts in the US and Russia on nuclear dangers. She is engaged in Track II diplomacy with Russia and has founded groundbreaking US-Russian exchange initiatives since the early 1980s.